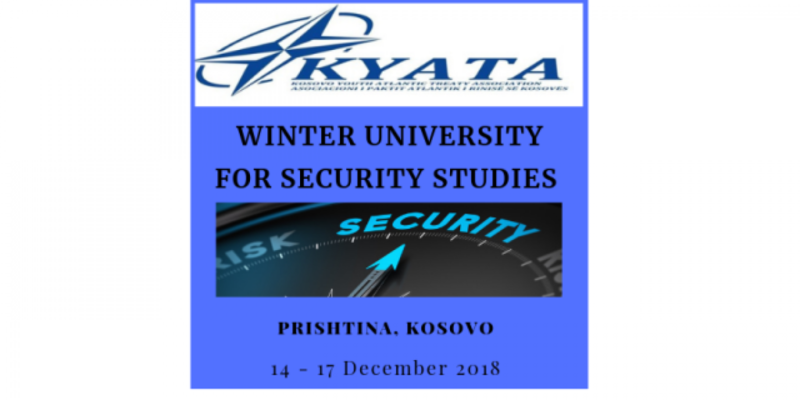 Kosovo Youth Atlantic Treaty Association has the immense pleasure of inviting you to participate in the event: KYATA “‎ Winter University for Security Studies” to be held on 14 – 17 December 2018 at NATO Corner of National Library of Kosovo. This Winter University provides a unique opportunity for university and college students to study the role, structure and activities of NATO and other security organizations, as well as the military, political – security, and economic issues facing the Alliance. Through this WU, students gain a better and clearer understanding of the capabilities and constraints that shape the policies of NATO and EU countries in determining matters of Collective Security. Apart from dealing with a prepared agenda, students grapple with a contemporary crisis to be revealed at the WU. Each participating university, students or participants will write an article that must meet the criteria’s to be published in Scientific Global Challenge magazine of the Diplomatic Academy of Albania. Upon the registration, participants shall receive the preparatory material, which include the Agenda, WU Handbook and pertinent NATO publications and other sources. During this WU participants will also have an excursion to our best city in Prizren also one cultural visit at our National Parliament in Prishtina. Balkan crossroads Russian influence vs Euro-Atlantic Integration of the region. This activity will take place in Prishtina, the capital of the Republic of Kosovo. While, for the foreign students taking part in this event, the accommodation will be provided at the Private Apartments in Prishtina. All participants or candidates that NEED NO VISA TO ENTER to the Republic of Kosovo are eligible to apply at the KYATA “‎ Winter University for Security Studies”. The ones who are interested in security policies and institutions, European politics, laws, history or culture. – For the participants from all other states is 125 Euros. – For the participants from all other states, it will include housing for three nights, it will include three lunches, lectures, workshops, materials and social events (excursion to Prizren). KYATA team is happy to announce two fully scholarships, the scholarship will be provided for Kosovo and International participants based on their request. The scholarship will cover the costs mentioned in the fee.